George Collichio is a National Recording Artist, Performer, Educator and private guitar instructor. George has nine National CD releases and plays over 100 shows per year. He is a College Professor (Guitar and Music Theory) and founder of "Collichio School of Music" with two locations and hundreds of students. He has played numerous events throughout the U.S. and Europe and has appeared and performed on National and Cable TV shows including The KUSI morning show (San Diego) and NBC (cable affiliate) news program. His latest release on Keiza Records was picked up by over seventy Radio Stations across the country and distributed world wide. He has worked and toured with renowned Bass player and founding member of Blood Sweet and Tears - Jim Fielder. George is available for solo acoustic concerts, corporate and private events, seminars and workshops. If you you would like private lessons and live in the Rochester area, please contact Collichio School Of Music. Skype lessons are also available for those outside the Rochester area. With “The Call”, the lively and optimistic, groove driven first single from his self-titled debut on Kezia Records, already catching fire at smooth jazz radio, George Collichio is primed – in the tradition of chief influence Larry Carlton – to become the genre’s next great guitar voice. Yet drawing upon a rich history playing thousands of gigs across the musical spectrum, the veteran performer,s repertoire juts way beyond those boundaries. In a musical age driven by a cookie cutter, hit single mentality, Collichio goes joyfully out on a limb to celebrate the true adventurous spirit of contemporary jazz. Ensembling brilliantly with members of the East Coast fusion band (and labelmates) Cabo Frio, he brings his love for Latin jazz, Brazilian samba, authentic flamenco and old school brassy soul to one of the most exciting instrumental recordings of the year. Collichio’s extensive discography includes eight previous independently released projects ranging from the acoustic guitar and percussion based The Field of Jaar to the rock fusion flavored Warfare (both 1997). Also available on this website are two Romantic Guitar Collections released in 1999, 2000’s Inspiration Point, featuring interpretations of classic hymns, a Christmas collection (’99), and the smooth jazz oriented Turn On The Light, released in 2001. George Collichio is the guitarists’s first collection to capture the full extent of the stylistic diversity hinted at in these previous releases. Before exploring more exotic and adventurous terrain, Collichio begins the new album with “The Call” and “Fruitful Vine”, both in the pocket, urban leaning tracks that perfectly display his powerful, emotional electric performance style, his crisp sense of melody and improvisation and an exciting duality with saxophonist Terrance Bruce. The lush, romantic ballad “All For You” lets the listener in on his softer acoustic side before “Lights Over Rio” takes us way down South for some plucky fingerstyling over a joyous and sensuous, rolling samba groove. Joe Santora’s wild piano soloing adds an irresistible energy as well. Collichio’s love for authentic flamenco music shines through on “Journey Home”, which begins as a thoughtful meditation featuring a balmy acoustic line before exploding into a full scale fiesta jam session. “In Your Hands” and “Biarritz” are buoyant, funk-drenched delights once again featuring Collichio working in perfect synch with Bruce, a working relationship which reaches an even more intense climax on the bold and brassy, classic soul influenced “Counterfeit Dream”. The last two cuts typify the dual moods of the collection, with <em>”Every Heart” easing into the dreamy chill mode and “One Touch” closing the disc with the wildest brass craziness and electric guitar improvising yet. Inspired by his guitar playing parents (father a jazz/blues performer, mother a fingerstylist who played at church), George Collichio has been playing since age six. He formed his first three piece rock band in high school and began teaching at 17. Over the years, he has moved his business to larger locations to accommodate his ongoing (and at first, delightfully unexpected) success. In addition to performing hundreds of gigs, seminars and workshops all across the country, Collichio—who recently began a formal endorsement relationship with the Rochester based audio interface product company Whirlwind Digital–owns the Collichio School of Music in his hometown of Rochester, New York, which has a current enrollment of over 370 students and employs several instructors. The curriculum focuses on individual instruction and offers classes in bass, drums, vocals and piano in addition to guitar. The guitar curriculum teaches all scales and modes, chord construction and inversions, interval and triad studies, basic comping, sight reading, rhythmic studies and ear training. A graduate of SUNY Empire State with a Bachelor’s in performance, Collichio has also performed thousands of gigs – including numerous church services as a special guest – throughout the country, and has appeared on national and cable TV shows, including the KUSI morning show (San Diego) and NBC (cable affiliate) news program and the Cavalry Satellite Network. He also performs at many corporate events in California, New York and Nashville and private events for high profile celebrities including pro golfer Bernhard Langer. In addition, Collichio has appeared on numerous outside projects with other artists, most recently a live CD with multiple Dove Award nominee and Latin recording artist Freddie Colloca. 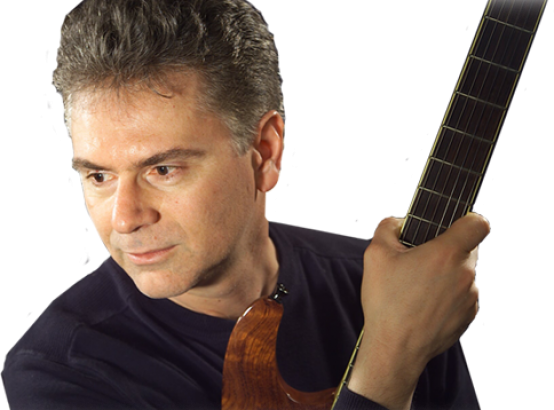 He has also opened shows for many notables, including internationally known guitarist Pierre Bensusan. “I love teaching and running the school, and playing a part in the development of young players. I love playing with great musicians who inspire me to keep getting better and grow as a musician. But in terms of expressing who I really am, there’s nothing like playing my own gigs and recording these projects. Something inside continuously drives me to do that. For Booking Information, contact George Collichio here.